"Kettle Cove" by Colin Page was the 2015 People's Choice winner in the annual Wet Paint Auction held by the Cape Elizabeth Land Trust. The Cape Elizabeth Land Trust will host its ninth annual Wet Paint Auction on Sunday, July 10, from 5-8 p.m., at the Spurwink Farm in Cape Elizabeth. The event includes live music, refreshments, catered hors d’oeuvres, art and an auction. Also, throughout the day, selected artists will paint on site at designated public and private locations chosen to highlight Cape Elizabeth’s natural beauty. The public is invited to watch the participating artists at work. Tickets are $60 in advance or $70 on the day of the auction. See www.capelandtrust.org to order tickets or for more information. 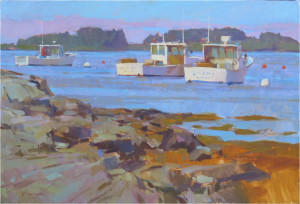 “Kettle Cove” by Colin Page was the 2015 People’s Choice winner in the annual Wet Paint Auction held by the Cape Elizabeth Land Trust.